Payment Instructions: We accept cash, approved checks (local bidders only) and wire transfers. A 12% online buyer's premium will be added to all sales conducted via Proxibid. Sales tax will NOT be charged - buyers will pay their own sales tax at the DMV of their state. Titles will be held for ten (10) days for local checks. Shipping Instructions: Vehicles are located at 315 Eastview Road, Pelzer, SC. Transport of the vehicles is the responsibility of the buyer. Preview Date & Times: Preview is available at our Gallery 315 location on Thursday Aprill 18th from 9-4 (CLOSED 12-1 FOR LUNCH). All items sell AS-IS with no warranties or guarantees expressed or implied. We reserve the right to add or delete items prior to sale time. Please send any specific questions to our email address or call us for more information. All sales final. NO OPEN TITLES ON VEHICLES! Online Bidding Terms: 1. Meares Property Advisors has put forth every effort in preparing the catalog for this auction to provide accurate descriptions of all items. All property is sold 'as-is' and it is the bidder's responsibility to determine the exact condition of each item. Printed statements or descriptions by staff are provided in good faith and are matters of opinion. Absolutely NO refunds will be offered. 2. FOR ONLINE BIDDING: There is a 12% Buyer's Premium added to your total purchase. 3. All accounts must be settled at the conclusion of the auction. We accept cash, approved checks (local bidders only) and wire transfers. A 12% online buyer's premium will be added to all sales conducted via Proxibid. Sales tax will NOT be charged - buyers will pay their own sales tax at the DMV of their state. Titles will be held for ten (10) days for local checks. 4. Shipping and transport of vehicles are the responsibility of the winning bidder. All vehicles must be removed from our parking lot by April 25, 2019, at 4:00 pm. 5. Our online auctions move quickly! If you are interested in an item, bid quickly. If you win an item in the auction you will be notified by email the next business day or at the close of the auction. 6. In order to better serve our customers, all bidders must provide their name, address, daytime phone number, and email address at which they can be contacted. This is to ensure good communication between Meares Auction Group and the bidder throughout any transactions. 7. The purchaser agrees to pay all reasonable attorney fees and costs incurred by the auction company in the collection of funds. The purchaser also agrees that a fee of 2% per month is added to the balance of any unpaid balance due the auction company and any other costs or losses incurred by the purchaser's failure to adhere to these terms. Any debt collection or dispute proceedings will be heard in Greenville County, South Carolina. 8. The auctioneer has the sole discretion to advance the bidding and may reject a nominal advance, should it in his estimation prove injurious to the auction. The auctioneer shall be the final judge in all bidding disputes and shall name a bidder as the purchaser. 9. The auction company shall not be held responsible for any 'missed' bids or bids unseen by the auctioneer. 10. All sales are final. 11. By bidding on any item, the bidder shows acceptance of the terms of the auction. 12. The auction company reserves the right to refuse service or decline registration to any person. All announcements made the day of auction take precedence over any and all written, verbal or electronic statements. Title in hand - Dual Axle. Folding Steel Equipment / Car Hauler Ramps. 30' x 7'. 8-1/4' total width with fenders. Heavy Duty Round Eye Tow Hitch for Pintle Hook. Wood Bed in great condition. This golf cart is in excellent condition! Comes stocked with 6 batteries and charger. Headlight, Windshield, and rear view mirror. Features many upgrades; custom seats with rear flip seat kit. Chrome front bumper. Chrome SS Wheels. Bluetooth with 2 speakers. Serial #PH1329-380531. Runs great and ready to go! Over $7,000 when purchased new. You've been outbid by K****5! by YOU! Features and Notes: This truck is in excellent condition and ready for service. 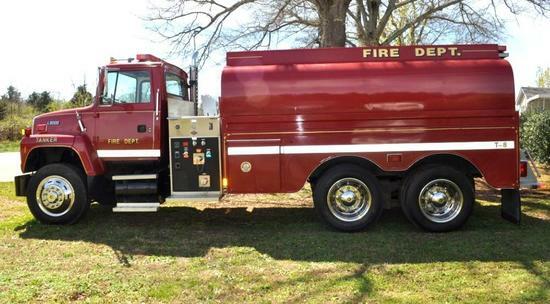 It features an automatic transmission, Cummins diesel engine, 3,000-gallon water tank, all pumps in good working condition, newer tires. Last used in 2018. Battery cover will be included with the truck - it is being manufactured at this time. You've been outbid by R****5! by YOU! You've been outbid by D****1! by YOU! You've been outbid by z****e! by YOU!